Swift, yet the rocks supporting the springs of Arunachala, have gentle gradient . That gives these springs a very sweet and cozy appearance. As if a mother, ready with her own hand cooked food, to feed her children. Even, when her child is absolutely detached from her, she never forgets for a moment, to think about him and feed him. Hidden behind the “The Springs of Arunachala”, are many caves which is popular destination for ‘would be saints’ to take up there Tapas. They still had to be close, in spite of looking for their own quiet space, to the flowing water, for their biological reasons. It was one of these springs , where I was meditating in the morning , when a sadhu, with a white robe came towards me with a sweet smile. Originally from Hyderabad, he said that for few years , he was now living at a cave, near to the spring . His beards have a shining black appearances, though skin color is little brownish. With a mysterious look he was looking on my forehead , for long time still I started feeling sleepy. When I woke up he was no longer there. I went ahead with my exploration of my springs. There are many springs which comes out in a very peculiar fashion inside the Hill. 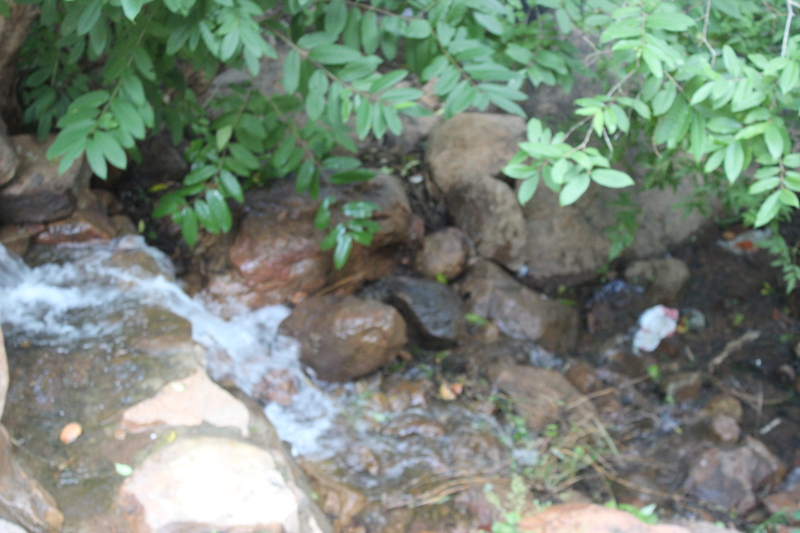 After the Guru Poornima Retreat 2012 , one of my favourite work was to find these springs which are scattered all around Arunachala. Often they are very good places of meditation . Right after Gurupoornima , the chaturmasha vrata starts . Chatarmasha is a vrata observed by the sages, and there disciples, starting from birthday of Sage Vyasa, which is the date of Guru poornima and this is the time read scriptures and do austerities to maintain discipline. Discipline is very important part, while circumbulating the hill too.One should never circumambulate the Hill on any kind of conveyance. For it is against dharma. There was a story from “Arunachala Mahatmaya” that Once upon a time a king named Dharmaketu who came from the world of Yama rode round the Hill on horseback. After completion of pradakshina his horse was transformed into a Gananatha. Amidst praises sung by the devas it left its master and gained the abode of Siva. Witnessing this the king repented and circumambulated the Hill on foot.Needless to say that he too joined the ganas and attained Siva’s abode. Since then Indra and the thiry-three crore devas as well as Vishnu go round Arunachala on foot. If the foot of one who circumambulates Arunachala bleeds, it will be wiped with the mandara flowers worn on Devendra’s head. The foot which happens to be injured while circumambulating will be soothed by the kumkum (vermilion) from the body of Goddess Lakshmi.